Do You Believe A False Gospel? Jesus died for all of our past, present, and furture sins. Jesus obeyed the law perfectly so that His righteousness can be imputed to us. Christians are “sinners saved by grace”. 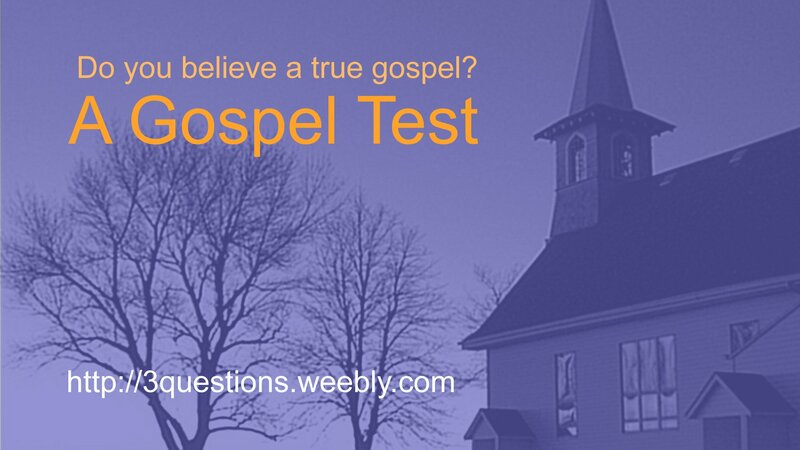 If you answered “True” to any of the above questions, you believe a false gospel. Let’s examine each of these statements one at a time. Question 1: Jesus died for all of our past, present, and furture sins. The Reformation gospel of Protestantism teaches that Jesus’ death on the cross and the shedding of His blood is an “atonement” or “covering”, not only for past sins, but for any sin a believer may commit in the future. According to this gospel, this “covering” is necessary so that when God looks on the believer, He doesn’t see sin, He sees the righteousness of Christ. The New Testament makes no reference anywhere of Jesus’ death being a “covering”. Jesus died for your past sins only! The Reformation gospel of Protestantism teaches that the standard of righteousness is perfect law-keeping. According to this gospel, because of man’s metaphysical depravity he is unable to keep the Law. But because of Jesus’ perfect law-keeping, His righteousness is imputed to believers. Therefore, believers are not righteous as a state of being, they are simply “declared righteous” (forensic justification). The Bible teaches that righteousness is apart from the Law (Romans 3:21, 28). To say that believers are “declared righteous” by virtue of some vicarious imputation of Jesus’ righteousness is an attempt to make Law the standard for righteousness. This is not righteousness apart from the Law. Furthermore, the Bible never states that believers have the righteousness of Christ. The standard for righteousness is the New Birth! When a person believes on the name of the Lord Jesus Christ, he is born again, literally “born from above”. When that happens, a believer inherits his very own righteousness from God because the old man who was “under law” has died, and in his place is a new creature who is the righteous offspring of the Father! And since this new creature is born of the Father, he is not under law. And since he is not under law, he CANNOT sin (1 John 3:9), because where there is no law, there is no sin! The Reformation gospel of Protestantism teaches that Christians are still sinners. Martin Luther referred to this as simul justus et peccator – “simultaneously saint and sinner.” According to this gospel, because Christians are still sinners, they are in need of perpetual forgiveness of sin. In other words, Christians are still metaphysically depraved. This statement is a contradiction. It is an impossible reality for man to exist in two different states at once. The Bible says that man is either “under law” OR “under grace”. “Under law” is the Biblical definition of an unsaved person. A person who is “under law” is under condemnation. Only those who are “under law” are sinners. So to say that a Christian is a sinner means to consider him still “under law”. The Protestant gospel makes Christians no different than the unregenerate. Such a statement is a patent denial of the reality of the New Birth. The New Birth is an existential change in a person’s state of being. A believer is literally reborn as the righteous offspring of the Father. He is no longer a “sinner” because the law is ended for him. Where there is no law there is no sin. Christians are righteous children of the Heavenly Father! The New Birth has freed us from sin. It no longer has any power over us. Man does NOT have a sin problem. Does man indeed have a problem? The Bible teaches that there are only two kinds of people in this world; those who are “under law” and those who are “under grace”. To be “under law” means to be subject to the Law’s condemnation, which is death, and ultimately the Lake of Fire. Every person ever born into this word is “under law” and is therefore condemned because at some point in his life he has broken the Law in one way or another. Even if a person has no knowledge of God’s Law from scripture, the Bible tells us that every man has the Law of God written on his heart, which is the conscience (Romans 2:14-15). The conscience is what gives man knowledge of right and wrong. One day, every person “under law” will be judged by God according to the Law, whether that be God’s law as recorded in scripture or by his own conscience. So clearly, man does indeed have a problem. The Bible describes Sin as an entity which seeks to wield control over others. (Genesis 4:7) Sin’s desire for control is manifest in man’s subsequent desire to wield control over others. Ironically, Sin obtains its power of control over others through the Law (1 Corinthians 15:56). Sin uses the Law to control others by provoking man to break the Law through desires. Once there is a law that governs some behavior, Sin uses that same law to provoke a desire to rebel against what that law requires (Romans 7:7-8). Without the Law, Sin has no power. Therefore, where there is no Law, there is no Sin. Any person who is “under law” is not only provoked by Sin to break the Law, but he is condemned if he does. So the problem then is not with Sin, rather it is the reality that any man “under law” is under condemnation. The solution then is that man needs a way to get out from under the Law’s condemnation. Man needs a new relationship to the law. When the Philippian jailer asked Paul and Silas how to be saved, their response was, “Believe on the Lord Jesus Christ and thou shalt be saved…” Belief means faith. Faith comes by hearing, and hearing by the word of God. A person is born again (literally “born from above”) when he hears about Jesus and believes what he hears. Hearing implies a cognitive process of allowing oneself to be persuaded by a reasonable argument. So we understand then that “faith” is more than just an assenting to the facts, but it has to do with being thoroughly convinced in your mind that something is true. God made it possible for man to get out from under the Law’s condemnation through the New Birth. When a person believes in the name of the Lord Jesus Christ, the “old man” who was “under law” dies. Laws have no jurisdiction over dead people. Dead people cannot be condemned. When the “old man” dies, a new creature is reborn in his place. This new creature is born of God. He is the literal offspring of the Father. This new creature is not born “under law”. The Law has no jurisdiction over him. This means the Law CANNOT condemn him. And since there is no Law to condemn this born again new creature, there is no Sin. The one who is born of God CANNOT sin! Notice, the apostle John does not say the believer “won’t sin” or “chooses not to sin”. He says he CANNOT sin. He is not ABLE to sin. Why is the one who is born again not able sin? Because sin has to do with Law. You cannot condemn one of sin when there is no Law under which to accuse someone. Think about it; if there was no 55 mph speed limit on the highway, and you were driving 56, would a patrol officer be able to write you a citation for speeding? Of course not. Why not? What law could he use of which to accuse you? There would be none. So it is with the one who is born again. The believer is no longer “under law,” therefore there is no Law than can be used to condemn. The believer has a new relationship to the Law. Since the Law can no longer condemn, the Law’s original intent can now be realized: to show love to God and to others! This is why believers strive to obey. It is not a means to merit some right standing with God. The believer is already righteous because he is God’s offspring. The believer obeys because he wants to show love to God and love to others. Love is the fulfillment of the Law.In fact, the Bible teaches that those who love God have a natural love for the Law as well. Even if there was no speed limit on the highway, would you still drive as fast as you possibly wanted? Hopefully not, because you would recognize the inherent danger, not only to yourself by driving recklessly, but also to the other drivers on the road. You would drive in such a way as to preserve your own life and the lives of others. You would be functioning according to the Law of Love. This new relationship to the Law through the New Birth is offered as a free gift to any who believe on Jesus’ death on the cross for the forgiveness of their sins. How does Jesus’ death on the cross forgive sin? This protective custody was in effect up until the time of Jesus’ death on the cross. Jesus’ death was the fulfillment of a promise made to Abraham. When Jesus died, He ended the need for the Law’s protective custody. When the Law ended, all sins that had been imputed to the Law were taken away with it. The picture of the “scapegoat” in Leviticus 16:21-22 describes what Jesus’ death on the cross accomplishes. The priest would lay his hands upon a live goat, a symbol of sins being imputed to the Law. That goat would then be delivered into the hands of a strong man who take that goat into the wilderness and release it. Jesus is that “strong man” who took away the sins imputed to the “scapegoat” of the Law. In essence, Jesus is both the “Lamb” and the “strong man”. He is the Testator of the Old Covenant, the One of whom the Law speaks, the One to whom sin is imputed. The death of the Testator brings an end (fulfillment) to that covenant, thereby taking with Him all sins which had been imputed to Him. Since the Promise of Christ has come, there is no longer a need for a guardian. The “covering” aspect of the Law is no longer needed. (Galatians 3:25-26) This is true for every person who believes in Jesus Christ for salvation. The New Birth puts the old man to death. All those past sins are forgiven. They were taken away when the Law was ended for him upon his New Birth. There is no ongoing need of forgiveness for “present” or “future” sins because the believer CANNOT sin. There is no Law to condemn him, therefore there is no sin. Why do Christians still “sin”? Man is and always will be a free-will agent. His behaviors are governed by choices that are the logical conclusions of his assumptions. Man was created by God to be a rational, thinking, creature. It is how man is made in God’s image. In this way, man is good. To say that man is “good” means to be good existentially, or that which is intrinsic to the nature of his existence. It means man has the capacity to act in accordance to the purpose for which he was created: to think, to reason, to live, to BE. That a man may make a choice to do evil does not mean that he IS evil. Conversely, that man may make a choice to good is not what MAKES him good. Man’s ability to even make a choice at all is what makes him “good”. He is functioning according to how God designed him to be. Do not misunderstand – “goodness” should not be conflated with “righteousness”. It is not a man’s choosing to do evil deeds (or lack of good deeds) which condemns him, no more than it is a believer’s choosing to do good deeds (or lack of evil deeds) which saves him. Unregenerate man is condemned because he is “under law”. A believer is saved because he is born again and NOT “under law”. Therefore, because one who is born again is not “under law”, there is no such thing as “sin” for the believer. Nevertheless, this does not preclude the fact that a believer can still choose to not obey the Law. At the same time, this does not give a believer license to ignore the Law. While failure to obey the Law no longer condemns the believer, it is still a failure to show love. Children of the Heavenly Father ought to behave in a manner that is consistent with their righteous nature. The Bible says the flesh is “weak”. Weakness does not mean evil. The apostle Paul said that the treasure of our righteous new creature-hood is contained in “clay pots”. So even though a believer is righteous, Sin still seeks to control him through the weakness of his flesh. And because man is a moral agent capable of free-will decisions, a believer can still choose to give in to fleshly desires provoked by Sin. But it is important to understand the distinction; such an action does not condemn! It is a failure to show love. This reality is incredibly freeing, because now a believer can aggressively pursue love without fear! A believer no longer has to worry about what laws he has kept or hasn’t kept because the threat of condemnation has been removed. That possibility is no longer hanging over his head like some impending doom. Now he is free to focus on just loving God and loving others, and the way he shows love is by striving to obey the Law. During Jesus’ earthly ministry, the Jewish religious leaders had come to believe that keeping the statutes in the Torah was what made a person righteous. But because they made the assumption that man was metaphysically evil, this assumption meant that man was disqualified from being able to understand the Law’s requirements. This is turn meant that if man could not understand the Law then man could not keep the Law. The Jewish leaders believed it was necessary for some mediator to dictate to man the requirements necessary for righteousness. To accomplish this, they crafted their own interpretation of the Torah for man to follow. Since man could not understand the Law, he could obtain righteousness by following the interpretations of the Jewish leaders. This interpretation is what was known as their “traditions” or “orthodoxy”. There are a number of problems with this, not the least of which is that the Bible teaches that righteousness is apart from the Law. As already mentioned, the apostles went to great lengths to make this point clear. For the Jewish religious leaders to hold this perspective, it was indicative of their egregious misunderstanding of the Law’s purpose. The Law was never intended to be for the purpose of obtaining a righteous standing with God. The Law is the means by which man shows love to God and others, but making the Law the standard for righteousness actually circumvents love. How does this happen? The Jewish religious leaders replaced the Law with their orthodoxy. The people were taught that since they could not keep the Law, it was pointless to even try. By replacing the Law with orthodoxy, the Jewish leaders effectively took away man’s only means of showing love to God and others. Rather than striving to show love to God through obedience, they became preoccupied with adhering to Jewish orthodoxy. Their lives were no longer characterized by love but fear. When the standard for righteousness is perfect law-keeping, fear is always the result. Fear is the result of condemnation. Condemnation comes from being “under law”. Any system that makes Law the standard for righteousness keeps man “under law”. The Jewish system of perfect law-keeping by adherence to orthodoxy kept the people “under law” and took away their means of showing love. This is exactly what Jesus accused the Pharisees of doing. The word translated “iniquity” in Matthew 24:12 is the Greek word ανομια (anomia). It literally means “no law”. This is the Biblical definition of antinomianism. It means to take away the law. Jesus said Himself that taking away the Law would result in love growing cold. And why wouldn’t it? If you take away the Law, you take away the only means man has to show love to God and others. Jesus spoke these words as a prophesy, but the end result of this logical progression of thought is always the same: taking away the Law results in a lack of love and lives characterized by fear. Be sure to understand the distinction. The Jewish religious leaders misunderstood the Law’s purpose. They thought it was for the purpose of meriting righteousness. But righteousness is apart from the Law. Righteousness comes through the New Birth. The Law is used as a means to show love to God and others. What was true of first century Judaism is also true of every religion that ever existed or still exists today: it makes some form of law-keeping as the standard for righteousness. Every religion begins with the same root assumption: that man is metaphysically evil, making him disqualified from being able to understand truth. Since he cannot understand truth he must have truth interpreted for him. Religious orthodoxy is nothing more than truth repackaged for mass consumption. It is therefore adherence to this interpretation of truth that brings righteousness. Protestantism is no different! But Protestantism’s version of orthodoxy is obfuscated under the pretense of “faith alone”. On the one hand, it will acknowledge that righteousness is apart from the Law; that man does not merit righteousness by keeping the Law. Then on the other hand, it will insist that Jesus keeps the law for us. In other words, since man cannot keep the Law, Jesus must do it instead. It should be blatantly obvious that regardless WHO is keeping the law, even if it is Jesus keeping the Law in our stead, it is still a righteousness that is based on perfect law-keeping. This is NOT a righteousness apart from the Law. Moreover, to rely on Jesus doing the works of the Law for us so that His righteousness can be imputed to us is nothing more than works-based salvation. For over 500 years, Protestantism has been perpetrating a fraud and a contradiction of epic proportions! Like every other religion that has come down the pike since the beginning of time, Protestantism is based on a faulty assumption that results in a willful misunderstanding of the Law. It is a religion of antinomianism that circumvents a believer’s ability to show love through obedience. It makes obedience nothing more than a subjective experience that Christ supposedly performs through the believer. It defies the believer’s natural inclination to love God’s Law. It defines righteousness as perfect law-keeping. This unwittingly puts the believer right back “under law”, the Biblical definition of an unsaved person. Protestantism views believers no differently than the unregenerate. Most importantly, the false gospel of Protestantism robs the believer of assurance. The Christian life becomes one of constant introspection of whether one is living by “faith alone” or not. Protestantism’s single perspective on the Law means the believer is in constant fear that he might come under condemnation. He is not free to love others. He is not free to love his Heavenly Father. He can never know for sure if he really is saved. Dear Christian brother, know this. The Bible says that we CAN know for sure that we are saved. When we understand that our righteousness comes by virtue of the fact that we are the literal offspring of the Father, everything becomes so simple. It doesn’t matter if we fail. Perfection is not the point. There is no condemnation for those who are in Christ Jesus! Believers are no longer “under law”. Where there is no law there is no sin. This is a wonderful reality! This is the Gospel news that believers need to bring to a world that needs to be reconciled to God. The world is full of unsaved people who do very good deeds. Whether he realizes it or not, every time man shows love to another, he is fulfilling the Law. It does not matter if the person is saved or not. Unsaved man has the ability to show love to others just as much as one who is saved. But it is not that expression of love that saves. It is not a fulfilling of the Law that saves. For even though an unsaved man might obey the Law of Love, he is still condemned because he is still “under law”. That is the whole point. Man does not have a “sin problem”. He has a relationship to the Law problem. This is why Jesus said to Nicodemus, “Ye must be born again.” The exhortation to you, dear brother in Christ, is this: Go out this day and show forth your love to God and others. You are God’s righteous child. Pursue obedience and fulfill the Law of Love! Please feel free to share this article with friends and loved ones. Protestant orthodoxy wreaks havoc in the lives of believers. It produces confusion, fear, and lack of assurance of salvation. 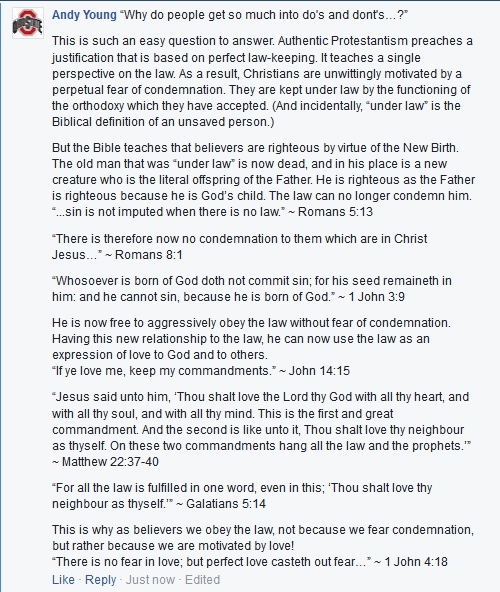 The screen captures below represent the confusion of one such Facebook user, who’s single-perspective on the law produces the very same “loveless” christianity that she bemoans. 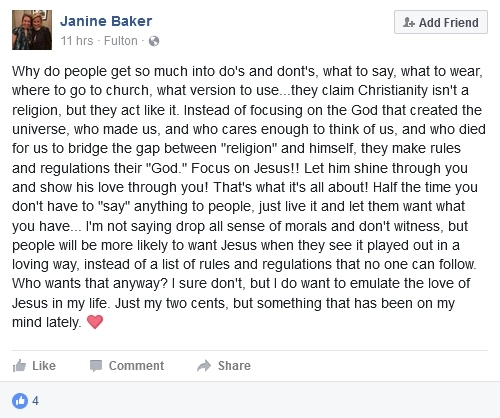 Notice in her post, it’s not our love but “Jesus’ love through us”. It’s a list of rules and regulations that no one can follow. She claims she wants to “emulate” the love of Jesus in her life, but that is impossible to do when your orthodoxy takes away the very means of doing so (anomia). This same person had posted just a few hours earlier that she was “feeling like a screw-up”, and that she prayed to God to show her that He loved her. How sad is that! But this is what protestantism does! Of course she’s going to feel like a screw-up, because she feels like she is constantly under condemnation. When you make perfect law-keeping the standard for righteousness, how else can you expect to feel when you fail to keep the law? Of course you would feel like God doesn’t love you because you’re a screw up. But then protestantism turns around and teaches us that, don’t worry, we’re all just totally depraved screw-ups. We’re just sinners saved by grace. As if that’s supposed to make everything perfectly acceptable. Does the Bible ever state that to love ourselves is a sin? I don’t believe so. In fact it never even suggests that we are to love others MORE than ourselves. We are to love others AS MUCH AS we love ourselves. To love yourself is to recognize your own value. If you do not recognize your own worth then you cannot recognize the value of others. There is application here for just about all of the problems we see in the institutional church. What is the historical orthodoxy? What has been taught about man? The metaphysical premise is man’s depravity. Man is taught that self-loathing is a virtue. Believers have been discouraged from striving for obedience to the law. The law has been replaced with orthodoxy (tradition). This is the definition of anomia; lawlessness. Jesus told the religious leaders of His day that by replacing the law with their traditions that they made the law useless. The result would be that love would grow cold. This is what such thinking produces. And this is exactly what we are seeing in this day. Is it any wonder? If one is taught that they cannot keep the law because of their own depravity, how can he possibly love himself? Why are there so many cases of divorce, depression, and mental illnesses found in the institutional church? Why do we act shocked when we learn about these sorts of things happening in the institutional church? For the believer, he is taught that an ever-increasing awareness of sin brings about an ever-increasing knowledge of God’s holiness. The Christian life is to be one of dwelling on sinfulness; not on value. How can we expect justice for sexual abuse and other physical or spiritual abuses? If one believes he has no value, how can he possibly love others? Others have no value. Others then are nothing more than objects to be used for one’s own end. Do you realize that if we spent our time focusing on loving others, we wouldn’t have to worry about breaking any laws? Think about that for a second. When it comes right down to it, isn’t the breaking of any law really a violation of the rights of another? It says, “I don’t value you.” Why don’t we steal? Is it because God said, “thou shalt not steal?” Or is it because we recognize that we would not want our things stolen? This ought to reveal our own sense of self-worth, which flies in the face of religious orthodoxy in direct opposition to the notion of total depravity. And in recognizing this self-worth, we then project that onto others. We recognize the value of others because we recognize our own value. God’s law teaches us that we have value! Man is and always will be a free-will agent. His behaviors are governed by choices that are the logical conclusions of his assumptions. Man was created by God to be a rational, thinking, creature. It is how man is made is God’s image. In this way, man is good. To say that man is “good” means to be good existentially, or that which is intrinsic to the nature of his existence. It means man has the capacity to act in accordance to the purpose for which he was created: to think, to reason, to live, to BE.